Many people think that starting a business requires a huge capital. But did you know that you can also be your own boss by trying the best business ideas with low investment? The best business ideas with low investment are slowly making their way into the mainstream. Thanks to today’s technology, you can now establish your startup without spending a fortune or be looking for investors. But before we explore the different ventures that you can try, let’s discuss the basic steps to starting a business. First, a lot of research is required. It’s important that you know the ins and outs of your chosen field before you decide to do anything. Next, formulate a business plan to get the wheels turning. A well laid out plan can help you achieve your goals in a more organized matter. Although the items in the list have low-cost investments, you’ll still need to spend some money to nurture the business. So it’s vital to take that into consideration. Finally, make sure to execute. Many people get stuck in planning when it comes to building their startup. Don’t be one of them and turn your ideas and plans into action. Now that you know the things to consider in building a startup, here are the 10 best business ideas with low investment and high profit. Social media has a crucial role in digital marketing today. Sadly, business owners fail to capitalize on this medium as they simply lack the time to manage social media accounts. This is where you come in. Offering your services to other entrepreneurs can help you establish yourself as a premier social media management specialist. This, in turn, will help you earn a progressive income over time. If you’re not yet confident with your social media management skills, don’t worry. There are many available courses and information online, and most of them are free to access. Are you an expert on fashion, travel, sports, or DIY? Then sharing your expertise in a specific field can be a great business venture. Build your own website and write blog posts or create videos. Just make sure that your content is something worth sharing, so you can easily get readers and followers. As your blog starts to gain traction, you can make money by offering advertising space or product reviews on your site. And since influencer marketing is a hot trend right now, you can also become an influencer for a brand. In relation to blogging, you can also earn money through affiliate marketing.You can feature and talk about other people’s products on your blog or website, and earn money if the product is sold through your marketing efforts. There are many businesses that offer affiliate marketing programs that won’t cost you much, so going this route won’t be a financial challenge. Majority of people today live in a fast-paced and busy lifestyle. Only a few have the luxury of doing chores like preparing their food, fixing their gadgets, and giving their vehicles a good wash. So why not make things easier for them and start a mobile services business? A mobile service business is a business that travels to its customers. You can offer car wash services, auto repair services, pet grooming, or personal training. You can also invest in a food truck. The key here is to identify that urgent need in your community, so there’s an assurance that people will avail of your services. This road can be a bit more challenging than the other entries in the list, but this is worth considering. Creating your own website or offering to build them for other brands is one of the most in-demand services today. Many entrepreneurs need their own sites today because they are jumping into digital marketing. Coding knowledge is definitely most welcome. You can take your pick from the multitude of available courses online that won’t break the bank. In addition, there are tools like WordPress that can help you build websites from scratch without writing a single line of code. For business owners, time is equal to money. Any time they spent on time-consuming tasks is money lost on their end. That’s why many entrepreneurs prefer hiring virtual assistants. As a virtual assistant, your responsibilities may vary. You may serve as a remote secretary for your client and handle all his paperwork, emails, and phone appointments. In the past, entrepreneurs are obliged to build a physical store for their business. Thankfully, there is now an alternative solution that can help you save money; the e-commerce stores. Setting up an online store gives you the freedom to sell to anyone in the world. It also lets you run promotions and marketing campaigns through Google or social media platforms. Fortunately, setting up an online store is easier nowadays. You can create your own e-commerce website, sell on e-commerce platforms like Taobao, or use social apps like WeChat. Do you want to make a living through writing? Then you might want to offer content and copywriting services. Good content is the heartbeat of digital marketing campaigns. Through writing awesome content and copy, you can help brands achieve their marketing goals while earning money. The best part? All you need is a computer and a stable connection to get started. If you have the penchant for molding minds, then this is a good business idea for you. You can offer one-on-one tutorial services online and offline. You can also sell online courses on platforms like Udemy. This option might take some time because you need to develop your course and find an audience, but your efforts will be worth it once people start enrolling in your courses. The best place to start this business is in your local area. Ask your friends and relatives if they need help with their upcoming events or projects, then offer your services. You can even nurture this business from your home and meet clients in cafes and restaurants. If you have a knack for photography or creating souvenirs, then you can include them in your business’ packages. The amount of data and technological resources today makes it possible for everyone to become an entrepreneur. So take advantage of these opportunities and create your own enterprise now. 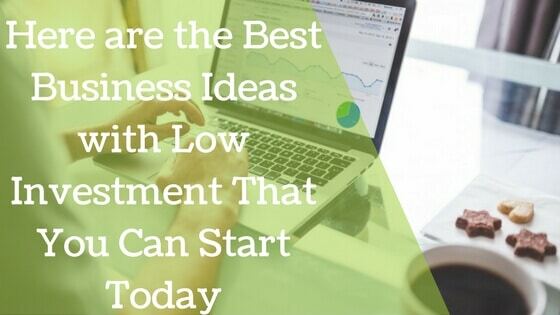 Which of these best business ideas with low investment caught your attention? Tell us in the comments!